An award winning Brisbane artist has collaborated with local landcare groups and council to create an exciting new public artwork in Carina Heights. Artist Frida Forsberg will be hosting a public unveiling at the Uniting Church at 330 Pine Mountain Road, on 18th February at 10:30am to be followed by eats and treats for guests. Councillor Krista Adams will cut the red ribbon in an unveiling ceremony and representatives from landcare groups and Urban Smart Projects will be on the speakers list. Frida is the latest of a growing group of artists to participate in a council initiative to beautify our cities by painting traffic signal boxes and Energex boxes on street corners and road verges. She said her design was inspired by the birds, plants and animals in the nearby Salvin creek and was intended to draw public attention to the importance of wildlife corridors in our suburbs. ‘The Powerful Owl is a focal point of the design, but there is also the red-necked wallaby, the koala, the grey goshawk, the sacred kingfisher — all of which can be seen in this area. We are lucky to share our suburbs with these creatures,” Frida said. 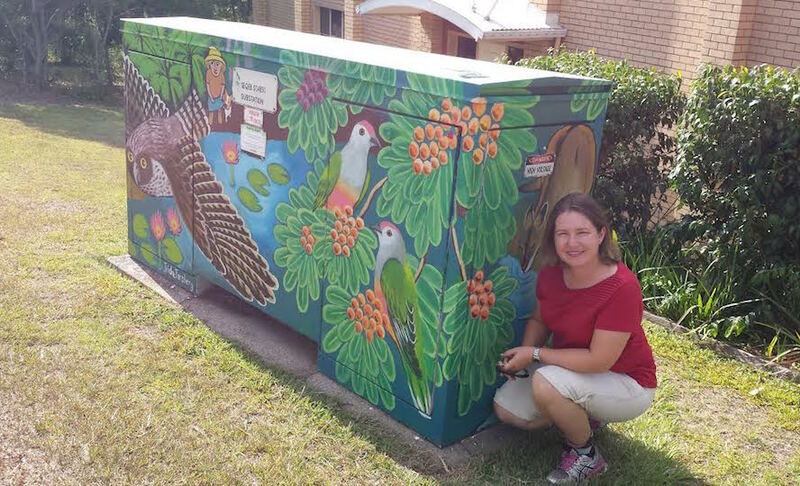 She consulted with local groups, such as Bulimba Creek Catchment Coordinating Committee, who have been maintaining bushland in the Bulimba Creek catchment, for the lists of plants and animals that were eventually represented in the Energex Box artwork. The box is next to the Salvin Creek waterway which locals and environmentalists have been fighting to save from being developed. Frida is a well-known environment campaigner, having been involved with bush preservation campaigns for many years, and her artwork regularly features in Australian environmentally themed exhibitions and events. Brisbane City Council’s Artforce project – painting hundreds of traffic signal boxes with original artworks – now also extends to selected Energex cabinets. Urban Smart Projects manages this popular initiative for Council. Energex cabinets are quite large and are a wonderful canvas for artists to paint colourful artworks that enhance Brisbane localities. Art Smart spokesperson: Catherine Ovenden. 3211 7178 or 1300 872 022. urbansmartprojects.com.